Are recurring drain clogs getting in the way of your day? It’s time to call All-n-One Plumbing at (816) 886-7600 for reliable drain cleaning services. We’re as committed to customer satisfaction as we are to helping you save – just visit our COUPONS page. Drain clogs are among the most common problems that homeowners in Independence, MO and the greater Kansas City area can face. This is because, unfortunately, many of us do not pay close enough attention to what gets washed down the drains in our sinks, tubs, and showers. Over time, clogs can form, leading to larger issues. 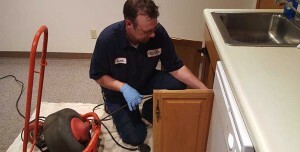 At All-n-One Plumbing our specialists are always available to help you with drain cleaning services and restore your plumbing system to perfect working order. Are You Having Issues With Clogged Drains? The best way to determine the severity of your clogged drain is to call in an expert for a professional assessment. Our technicians can help you figure out how serious the clog is and provide speedy solutions to restore the flow of water to your pipes. Water is backing up into your sinks, floor drains, toilets, and tubs. Your toilets are not flushing properly. Your tubs, sinks, toilets, and showers are taking longer to drain. You have noticed foul odors coming from inside your drains. Feel confident in our warranty: If you experience an issue during our warranty period, then your All-n-One Plumbing specialist will return to fix the problem without any hassle on your part. Friendly and professional service: Our team understands that customer service is the cornerstone of our business, and we will find solutions that work for you. Get quick results: We know your time is valuable, which is why we arrive on time and work to resolve your issue as quickly as we can. We are locally-owned and family operated: We understand the value of good service, as well as the importance of making the right decisions for your loved ones. We work hard to keep your pipes clean: If recurring clogs and backed-up drains are an ongoing issue, we will use professional hydrojetting to blast away stubborn debris clinging to the interior walls of your pipelines. Our team is dedicated to keeping your drains clean and clear, so why wait? Call (816) 886-7600 today and get quick drain cleaning solutions you can trust in Independence, MO and the Greater Kansas City Area.